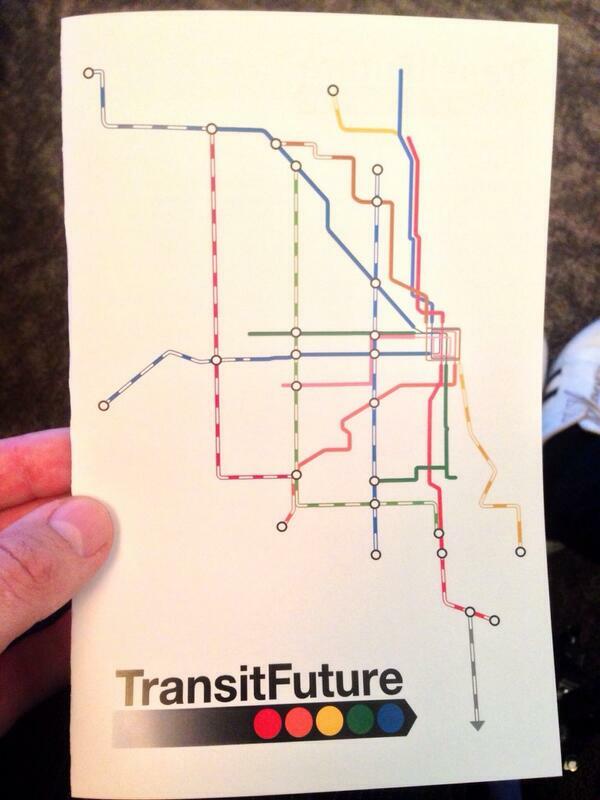 In case you haven’t seen it, the Center for Neighborhood Technology and Active Trans launched a new campaign to get an LA-style dedicated Cook County-level revenue stream for public transit today. County Board President Toni Preckwinkle and Mayor Emanuel spoke at the press conference. The website is here. Not a lot of details yet as to the form of the campaign or proposed revenue mechanisms, but it should be on your radar. Maybe let your county commissioner know you support it. This is definitely interesting! I see that they have added extensions to the Red Line (probably to 130th Street), the Orange Line (probably to the Ford City Mall), the Blue Line (to some western suburb and some northwestern suburb), and the Brown Line (probably to the Jefferson Park Blue Line stop). I suppose that the gold dotted line is the proposed Gold Line on the Metra Electric, the blue dotted line is Ashland BRT, and the green dotted line is a proposed line on the Chicago Belt Railway (this is a really cool idea that I haven’t heard of before). Now what is the red dotted line? Google Maps says that there is a railway line that runs near Midway Airport and mostly runs parallel to 25th Avenue before reaching O’Hare, but I can’t find any information about it. Also, what is the grey dotted line that extends south from the Red Line? Is it just the Metra Electric? It would definitely help a lot of people if these transit improvements actually happened, but it would take a lot of federal funding, cooperation from METRA, and negotiation from suburban NIMBYs. The grey dotted line is the Metra South-East service.